French video sharing site DailyMotion is bidding for the French Soccer Premier League TV broadcast rights (actually, the VOD online magazine part) for seasons 2008 to 2012. The startup competes against medias giants Canal+, TF1 and France Télévisions, TV channels M6, Eurosport, and Direct8, but also against telcos Orange and SFR. See here for more details (link in french). Check this brand new internetTV startup, live since a couple of hours. No need for huge fundings anymore. Good luck, Folks ! The famous/must-read/sometimes-hilarious/always-right-but-on-portugal-matters/almost-as-good-as-the-real-one Fake Steve Jobs gets it on the forthcoming revolution which will change the Television industry for ever. French TV production firm 2T Productions (well, the site still under construction as of today 05/25 26/07) is to launch kazados.tv its first television channel next week. As the iCTO, I have had the chance to participate to the adventure for a while. Kazados.tv is supposed to be the very first InternetTV station for Teenagers, made by Teenagers. When I started working with 2T Productions as advisor in late January this year, the WebTV or InternetTV * world was still in its infancy. Kazados was one the of very few projects aimed at real TV ** experience : live streaming, as opposed to the classic progressive download technic used by the YouTubes, the vPods, and the likes. Launch your web browser, go to kazados.tv, and boom, you watch TV. You get the idea. We spent most of February and March to find out the best solution for the technical infrastructure : basically speaking, 2T is a ' Content ' provider, not a Web hosting/broadcasting platform. So, 2T decided to go for the second option : collaborate with an existing firm. Enter ipercast, a multimedia services provider based in Paris, vPod, the famous startup lead by Rodrigo Sepulveda Schulz, Gilles Babinet' Eyeka, and a few other smaller players. Issue #1 : those very talented and smart guys still didn't get it. They all offer Progressive Download and/or VOD Video-On-Demand services, whilst Kazados is a real television channel, meaning it's broadcasting a live video stream. On top, kazados.tv is a full-Flash website, featuring Flash video files. Hosting it onto their respective platforms wasn't an easy task, requiring too much development work for their sw teams in regards of the tight schedule. In the meantime, we took a look outside the french borders. Democracy was an interesting option, but the folks out there seemed to be too busy to answer my calls properly. Nevertheless, the concept is interesting. Then came Joost, which we couldn't test on time for the launch of kazados.tv next week. Veodia, which is an outstanding platform for real professionals, was just starting when we had to take a decision, and Mogulus, which seems to be the perfect solution to test new online TV concepts, was operating in private beta. However, over the last month the landscape has changed quite dramatically. InternetTV and UGC become mainstream, see the numerous recent announcements. Justin.tv is the hot stuff at the moment. Always surprising to see what teenagers are watching on television, no matter it's on the Net or not ! Last, I wish kazados.tv would have been made of mixercast, vPod, and Joost for all the user interface stuff, Mogulus for the features set, and Veodia for the flexibility. I also wish someone will soon come with a solution for live text caption for disabled people : those among the population who can't hear properly can't certainly not jump on the WebTV bandwagon. Plus, once you can insert text caption, you can also insert text translation. See the video below for a better understanding (joke). More info on Flash Video here and here (Adobe' DevCenter is a fantastic source for self-training), and video webcasting technologies here. Chris Tew of WebTVWire does a tremendous job watching the internetTV trends, read for instance " Online Video No Threat to Television says YouTube " here. Chris has published a very detailled review of Mogulus here. 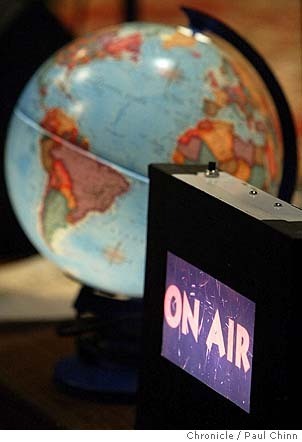 Another great source of information is Broadcast Yourself Live On The Web: Best Tools To Create Your Own Live Web TV - A Mini-Guide written by Michael Pick of MasterNewMedia : a must read. * I still don't know how to say, because the two words are in use today to describe the very same thing : watch a TV channel on the Web. See dictionary here for more details, and read the impressive list of internetTV services already available. ** I'm not talking about those RealTV things.